IKea LED lighting strip flexible LEDBERG Multicolour 5 mtr. You could cut down your electricity bill by up to 88% by replacing 250W incandescent bulb with 30W SANSI LED light! What Your Get From SANSI: The LED Security Light with two lamp heads and a motion sensor, a Bar-shaped mounting plate and 3 screws, waterproof gasket, 3 wire connectors, mounting bolt, rubber screw plug. 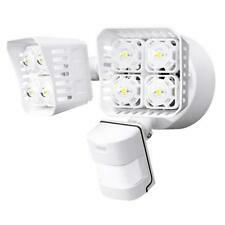 SANSI LED Security Lights, 18W (150Watt Incandescent Equiv.). 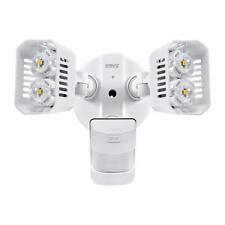 SUPER BRIGHT WITH WIDE COVERAGE: Adjustable super bright dual-head with 4 LED bulbs produces up to 1800lm brightness. The Sansi Security Light covers 861 square feet when being wall mounted at 8 ft, providing the brightness you expect in a high quality and highly effective security light. T5 8W FLUORESCENT LAMP (2PCS) INCLUDED. PROVIDES KNOCK-OUT HOLES FOR POWER CORD, ROCKET SWITCH AND CONVENIENCE OUTLET (OPTIONAL). PROVIDES KNOCK OUT HOLES ON SIDE/REAR OF FIXTURE FOR EASY INSTALLATION. 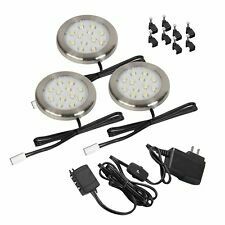 These lights are perfect for parents, they provide enough illumination to see and move at night without disturbing your baby or child. They save on energy both by being very energy efficient but also by shutting off when they are not required! 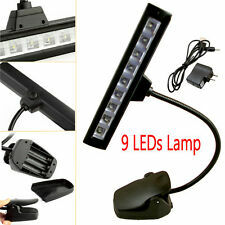 4.5 out of 5 stars - 2 Night Light Energy Saving Automatic Sensor Wall Plug In Lite Nightlight Lamp ! 20 product ratings20 product ratings - 2 Night Light Energy Saving Automatic Sensor Wall Plug In Lite Nightlight Lamp ! Tan 30 Pieces to make a whole round light. No bulb included. SANSI was established in 1993. Our products are superior in their quality and performance to the rest of those on the market. Choose SANSI, choose a better lighting experience. SANSI 50W LED Flood Light, 350W Equivalent, 3500lm Bright Security Light, LED Work Light, 5700K White Backyard Lights, Outdoor Front Yard Light, Waterproof Floodlight Lamp, 5-Year Warranty, 90-264V. Trending at $36.11eBay determines this price through a machine learned model of the product's sale prices within the last 90 days. Yellow 30 Pieces to make a whole round light. No bulb included. Illuminate the front porch in sleek, contemporary style with this Fulcrum 20031 motion-sensor LED porch light. Use it at a side door, on a back deck, along a driveway, next to the garage or any other outdoor space. Kerr Lighting. If you need more just call Paverlightinternal. Mint Green 30 Pieces to make a whole round light. No bulb included. The E26 series 5 in. gimbal trim provides precise, variable directional lighting. For use in conjunction with 5 in. new construction or remodel recessed housings. Adjustable gimbal - trim. INCLUDES (20) NEW PANASONIC BATTERIES! 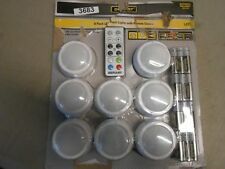 6 LED Puck Lights. Duracell 18 AAA Batteries included. Condition is New. Power SourceBattery Powered. Part Number72521. Special Featureswireless. Type of BulbLED. Item model numberLED/FLUTE. This designer-approved style takes the guesswork out of the equation, allowing the decor characteristics and functionality to be the focal point of the space. 4.5-Watt, MR16 GU10 LED bulb (included). Trending at $18.26eBay determines this price through a machine learned model of the product's sale prices within the last 90 days. For up to 200 watt bulbs. The problem is that your electronics LED lights are too bright. Lightdims are specially designed, removable tiny covers that act like sunglasses for irritating LED's on your electronics. Lightdims dim unwanted LED glare or flare when ambient light in your room is turned down or off. Halogen Under Cabinet Puck Light WAC Lighting - HR-88-BRUSH NICKEL NEW IN BOX! It is not intended for use in ceilings or walls. Low profile design allows for shallow installation depth. Built-in auto reset. 20W Halogen bulb. Short and overload circuit protection technologies. 72" of lead wire. 5 out of 5 stars - Halogen Under Cabinet Puck Light WAC Lighting - HR-88-BRUSH NICKEL NEW IN BOX! 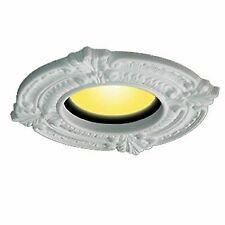 1 product rating1 product ratings - Halogen Under Cabinet Puck Light WAC Lighting - HR-88-BRUSH NICKEL NEW IN BOX! As a fully functioning remote, it can set the speed of a fan by reading the room temperature. Hampton Bay. Designed for indoor use only. 4 AAA batteries required. (Continental. ). The perfect combination of traditional details with a contemporary flair. White opal glass shades are pleasing to the eye. Includes white opal glass shades. For indoor use. Uses only 9.5 watts. Warm white 3000K. If an identical item is unavailable, we reserve the right to substitute an item of equal or greater value at our discretion. Photographic proof may be all that is required.